On the very first day Senate Republicans are back home for spring recess, let’s make sure they hear the sound of their constituents, as we raise our voices together calling for the refusal of Supreme Court nominee Chief Judge Merrick Garland. 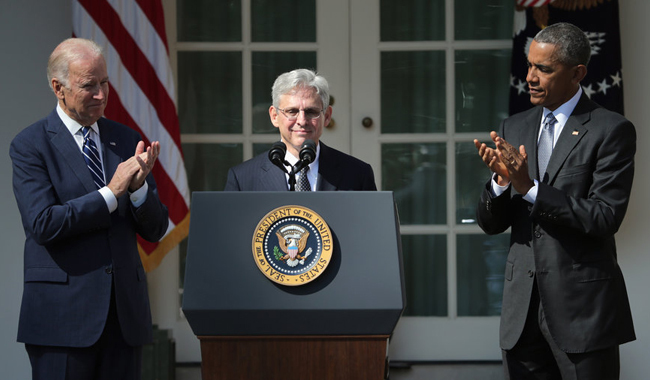 Judge Merrick Garland may well be the most moderate Supreme Court nominee anyone could expect from a Democratic president, but he’s also a justice who could create the first liberal majority on the high court in more than 40 years. The pending battle over immigration is another major test of regulatory power. At issue is whether Obama has the authority to temporarily suspend deportation and to offer work permits to several million otherwise law-abiding immigrants who have been working and living illegally in this country. Obama’s lawyers say federal law and past Supreme Court decisions give executive officials leeway to decide who should be deported, while lawyers for Texas and 25 other Republican-led states disagree. The Texas case will be argued in April before the eight justices. But looking forward, the ninth justice will be in a position to decide whether the next president has broad power, or a limited authority, when it comes to immigration. Back in 2007, Judge Garland voted to undo a D.C. Circuit court decision striking down one of the most restrictive gun laws in the nation” and voted “to uphold an illegal Clinton-era regulation that created an improvised gun registration requirement.” Obama will use his pick to pursue a gun control agenda. The overwhelming majority of Americans support their right to own a firearm for self-defense. Therefore, the NRA strongly opposes the nomination of Garland to the Supreme Court. Nothing less than the future of our Second Amendment freedom is at stake. On environmental law, Judge Garland has in a number of cases favored contested EPA regulations and actions when challenged by industry, and in other cases he has accepted challenges brought by environmental groups. That could be very important, with Obama’s Clean Power Plan in the balance. Just four days before his death, Scalia joined a 5-4 order siding with coal-producing states and putting the Clean Power Plan rules on hold while a legal challenge plays out in the D.C. Circuit this year, and presumably in the Supreme Court next year. Power in raising our voices together. Power that Senate Republicans can’t ignore, especially once their district phones start ringing! Your duty is perfectly clear. The president has nominated another liberal schill to the SCOTUS. Now it’s time for Senate Republicans to do their job and block the hearing and deny Judge Garland. It’s up to you to make your voice heard!